The film is being hosted by a local nationally certified classical homeopath Abby Beale CCH, who is also board president for The National Center for Homeopathy. Join Public Services Librarian Lisa Sprague for a discussion of Jade City by Fonda Lee. Members gather for dinner and the annual meeting and elections. Join Deputy Director Katie Werth for a discussion of Wildflower Hill by Kimberley Freeman. Forced to take her life in a new direction when an injury ends her ballet career, Emma returns to her home in Australia and learns that she has inherited an isolated sheep station from a late grandmother who would impart key lessons about love and motherhood. Compared to the Connecticut River, the Scantic River seems tiny and insignificant. Yet, in the past nearly 150 mills were powered by the Scantic and its tributaries! How could this be? Enfield Historical Society president Bill Friday will answer this question and more. The Scantic River passes through or drains parts of ten towns in two states before emptying into the Connecticut River. Bill will briefly explain the geologic history that created the river, then talk about the Industrial Revolution and local history that led to the founding of settlements and construction of mills in the Scantic River watershed. Information about dozens of different mill types, scores of mill sites, and over 140 mills will be presented: familiar Enfield mills like the Gordon Brothers mill and Hazard Powder Company mills in Scitico and Hazardville; mills in other towns like the Somersville Mill; and others that have faded from memory. Your questions are welcome, as are your memories of any of the mills. Mike Cascia will lecture on Poulenc’s Dialogues des Carmélites. At the start of the French Revolution shy Blanche becomes a novice nun in an convent run by an elderly prioress. Blanche’s aristocratic family flees the Terror but she remains behind, caught between her fear of the guillotine and her duty to the convent. When the nuns are expelled and threatened with death, Blanche must make an agonizing decision. Sponsored by the Friends of the Enfield Library. The Friends gather to plan for their annual book sale to be held June 7-9. Join Public Services Librarian Lisa Sprague for a discussion of Foundryside by Robert Jackson Bennett. In a city that runs on industrialized magic, a secret war will be fought to overwrite reality itself. Join Deputy Director Katie Werth for a discussion of Himself by Jess Kidd. Twenty-six years after he was abandoned at an orphanage, Mahony returns to the rural Irish village he was born in, determined to discover the truth, after receiving a mysterious note suggesting his mother met foul play. A struggling attorney and new mother (Felicity Jones) faces adversity and numerous obstacles in her fight for equal rights. When she takes on a groundbreaking tax case with her husband and fellow attorney, she knows it could change the direction of her career and the way the courts view gender discrimination. 2 hours. Join Public Services Librarian Lisa Sprague for a discussion of Tales of the Dying Earth by Jack Vance. As a swollen red sun grows ever closer to annihilating the Earth, decadent magicians compete for the technology of an ancient age — a science now known as magic. Broke, alone and facing foreclosure on his business, 90-year-old horticulturist (Clint Eastwood) takes a job as a drug courier for a Mexican cartel. His immediate success leads to easy money and a larger shipment that soon draws the attention of a hard-charging DEA agent. When Earl's past mistakes start to weigh heavily on his conscience, he must decide whether to right those wrongs before law enforcement and cartel thugs catch up to him. 1 hour, 55 minutes. Join Deputy Director Katie Werth in the Wellness Room of the Enfield Senior Center for a discussion of Sweetgrass by Mary Alice Monroe. The Blakely family, despite the tragedy that separated them, must band together to save their historical plantation, which has been in the family for generations and is the only thing that holds them all together, from being sold to developers. Join Deputy Director Katie Werth in the Wellness Room of the Enfield Senior Center for a discussion of Our Souls at Night by Kent Haruf. September 23rd: Applications - what to do before, during, and after the application process; how to upload and download application-related documents such as resumes; what is and isn’t necessary to include in the application. Join Public Services Librarian Lisa Sprague for a discussion of Into the Drowning Deep by Mira Grant. Join Deputy Director Katie Werth in the Wellness Room of the Enfield Senior Center for a discussion of Rebecca by Daphne de Maurier. A classic novel of romantic suspense finds the second Mrs. Maxim de Winter entering the home of her mysterious and enigmatic new husband and learning the story of the house's first mistress, to whom the sinister housekeeper is unnaturally devoted. 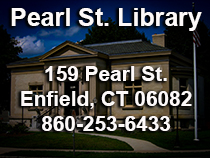 Join Public Services Librarian Lisa Sprague for a discussion of Sea of Rust by Robert Cargill. A scavenger robot wanders in the wasteland created by a war that has destroyed humanity in this evocative post-apocalyptic robot western. Cookie maker Hannah Swensen decides to investigate when Ron LaSalle, the beloved delivery man from the Cozy Cow Dairy, is found murdered behind her bakery. oin Public Services Librarian Lisa Sprague for a discussion of Stranger in a Strange Land by Robert A. Heinlein. Raised by Martians on Mars, Valentine Michael Smith is a human who has never seen another member of his species. Sent to Earth, he is a stranger who must learn what it is to be a man. Choose a recipe from the selected cookbook, prepare it, and bring your dish for sharing and discussion. Cookbook is on display at the Reference Desk. This month’s cookbook is Valerie’s Home Cooking by Valerie Bertinelli. Marc Black, recent inductee into the NY Chapter of the Blues Hall of Fame, has created an engaging and humorous program… and an opportunity for the audience to relive this colorful time in our history. Well received all across the Country in libraries, art centers and small theaters, folks cheerfully sing along beginning to end! In the presentation, Marc uses a wide range of popular songs including surprising favorites like Itsy Bitsy Teenie Weenie Yellow Polka Dot Bikini, great rock tunes like Blue Suede Shoes and moving folk songs like Bob Dylan’s Blowin’ in the Wind. The show also features a performance of his own group’s hit from 1967… Happy by the Blades of Grass. And now, the program is being offered with a slide show that’ll slide you right back in time! This thought provoking, multi-media show is bound to get everyone singing and feeling good about where we are…and where we’ve been. A rare glimpse into the relationship between beloved children's author (Domhnall Gleeson) and his son Christopher Robin, whose toys inspired the magical world of Winnie the Pooh. 1 hour, 47 minutes. When love-struck twins Siegmund and Sieglinde find each other at last, Siegmund promises to release Sieglinde from her forced marriage by killing her husband, Hunding. The god Wotan instructs Valkyrie warrior Brünnhilde to defend Hunding but, moved by the twins’ devotion, Brünnhilde disobeys, instead forging an alliance with Sieglinde that will have far-reaching consequences for them both. Sponsored by the Friends of the Enfield Library. 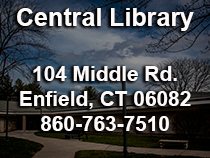 Join the Friends of the Enfield Library as they welcome guest poet Joe Adomavicia.